Police officers are being targeted for assassination; there are an increasing number of jihadi attacks across the world; tens of thousands of Christians are being slaughtered by Muslims in Africa, the Middle East and elsewhere; a flood of refugees from hostile countries are being forced on local townships across America as a part of federal government plan funded by tax payers; our critical infrastructure is dangerously vulnerable; our military is being gutted, courageous leaders are being punished, and our nuclear forces are decaying; there is a disregard by our leadership on both sides of the political aisle for the rule of law and our Constitution; many Christian and Jewish leaders stand on the side of tyranny with socialists and jihadis in the name of “tolerance”; there exists a unified effort by the socialist Left in America and the Islamic jihadis to silence all forms of communication which brings the truth to light and call this evil out for what it really is; Russia stands ready to engage the U.S. militarily; and this administration openly supports the largest state sponsor of terrorism in the world – Iran – in developing nuclear weapons which it says will be used to destroy Israel and the United States. This is where we are today in America. Yet, Americans still feel compelled to ask if this is intentional or just the result of poor policies that have gone awry. You do not have to be a political scientist to understand America is and is headed exactly where the Jihadis and the Progressive Left Movement has worked for over 50 years to take this nation. This is the intentional outcome of a decades-old effort to bring the United States down. Growing up, President Obama went to an Islamic school. His father and step-father were Muslim, and his greatest mentor, according to the President, was a card carrying member of Communist Party USA (Frank Marshall Davis). 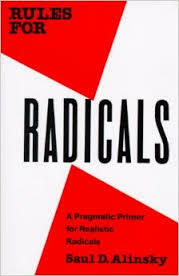 Mr. Obama studied and taught Saul Alinsky’s Rules for Radicals, which is Marxist revolutionary ideology. In that book, you will see all of the tactics detailed which we are now witnessing on the streets of America. Just like a playbook. It should be noted Rules for Radicals is dedicated to Satan – by the way. So where did the President learn to respect America’s founding principle that our rights come from God and that all of our laws and moral standards flow from that point? He never did. Today the forces of the Marxists and socialists have a well-funded and well-organized movement to destroy the foundations of this Republic while the jihadis have an even more well-funded and well-organized effort to destroy us as well. The facts and evidence have been on the table for sometime with no thoughtful or factual debate coming from another point of view. Those defending the founding principles of this great Republic are told to shut up and stop being so “racists” or “hateful” or whatever other adjective they throw out. Just like the Nazis, Lenin, Stalin, Mao, and so many other tyrants have done over the years. The first step in maintaining a free society is for citizens with courage to stand in that freedom and refuse to slowly get washed out into the sea of slavery. We must count the cost and be ready to give everything to maintain the liberty our founders gave to us with the blessing of Almighty God. YES!!! It is so good to hear you voicing the truth. I have been a diligent student of the events of the past decade and a half and I have come to the exact same conclusions. I am doing all I can to spread the word. If there is anything I can do to help you out I will do what I can. I am a father of a Catholic family of 4 children (and a fifth on the way), a medical-retiree from the United States Navy (10 years of service & medically retired in 2010), and I am a Software Engineer. I want to help stem the tide of evil that threatens to destroy Christians and to destroy the United States of America! Thank you!